The new version of KooZic (v0.3.0) is officially out! The main feature of v0.3.0 is the support of the Subsonic API. Practically, it means that any third-party application compatible with a Subsonic server is compatible with KooZic out of the box! The efforts have been focused on the support of mobile applications, on both Android and iOS devices. The goal was to support as many features as possible, and so far we could achieve an excellent support for the main purpose of KooZic: music streaming ;-) Oh, and by the way: no license fees with KooZic! Here is a list of mobile applications, and their compatibility with KooZic. Three applications were tested amongst the most popular ones. Their compatibility with KooZic is excellent, whatever your choice is. A new menu gives a quicker access to musical genres organization. 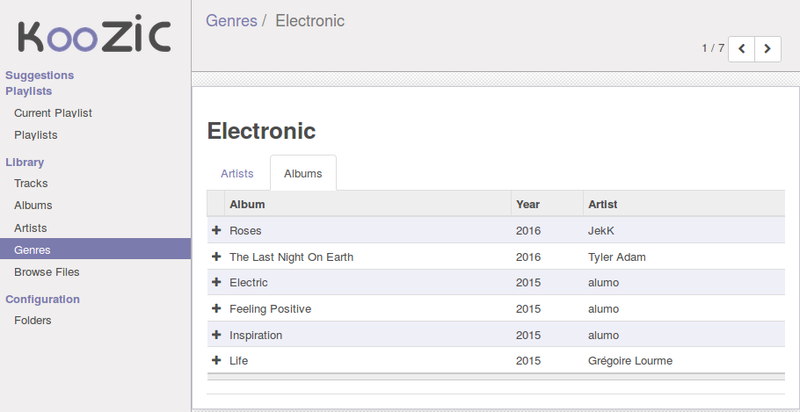 For a given genre, you can find the list of artists and albums related. Aside from the Subsonic support, most of the development focused on performance improvements and maintainability. Image caching has been simplified and rationalized, while LastFM caching mechanism has been completely rewritten to make it much more flexible. However, nothing noticeable for the end user, except a few visual tweaks here and there.